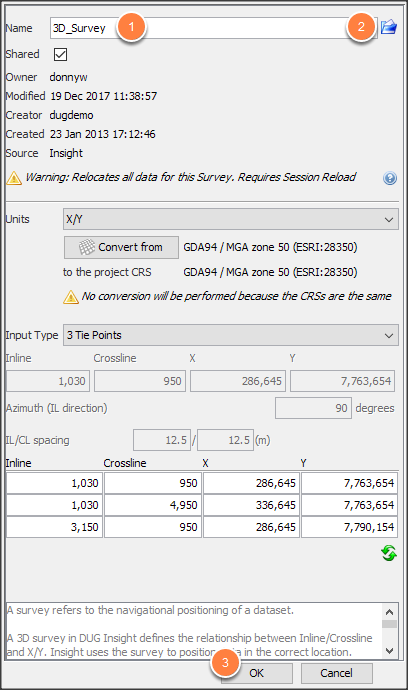 DUG Insight User ManualFrequently Asked QuestionsFrequently Asked Questions SurveysHow do I set boundaries for my 3D survey? Insight automatically extends 3D surveys to include associated data, horizons and volumes. Remember to check the Product Extents Table for any objects that might cause the 3D survey to expand. In some cases, the survey extends further than is required, making the Map View harder to use. Use this workflow to reduce the displayed survey extents in the Map View. Note: The survey boundaries are for display only. They update to contain the coordinates of anything assigned to the survey. Updating them will not affect the positioning of anything in the project. Control Panel > Survey tab, right-click the desired survey and choose Export (see Exporting a Survey). Example format of .survey file below, more examples available here. Survey files are easy to update. Use any text editor to open the .survey file and update the min and max values for IL and CL. We’re ready to update the survey with the new extents. Open the Survey tab in the Control Panel. Double-click the survey to adjust. Alternatively, right-click the survey and choose Configure 'Survey'. Type a new name in Name field. Click the Select File icon to the right of Name field. 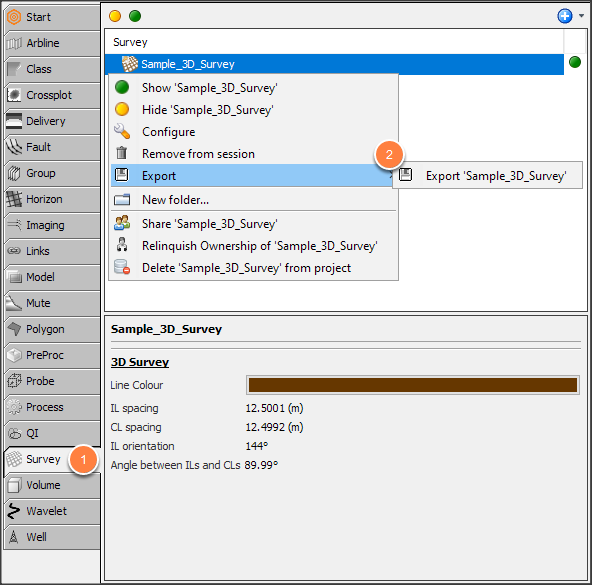 Select the 3D survey file (e.g. '3d_survey.survey') that you updated and click Open. Next: Can I store a volume outside the project directory?